This web page provides a description of the Sulzer RT Flex electronically-controlled common-rail system embodied in Sulzer RT Flex low-speed, two stroke marine engines. It covers the main elements of the RT Flex system - the supply unit, rail unit and electronic control system. The system's benefits are reviewed, together with its reliability and built-in redundancy. Download the original PDF version here. Instead electronically-controlled common-rail systems have been adopted in the new Sulzer RT Flex engines to give complete control of the timing, rate and pressure of fuel injection and the exhaust valve operation, allowing patterns of operation which cannot be achieved by purely mechanical systems. Rather than 'electronically controlled', it would be more accurate to describe Sulzer RT Flex engines as being computer controlled. This is because in the RT Flex system, engine functions are fully programmable, perhaps limited only by the designers' imagination and the laws of nature. The challenge is to use this freedom to create practical benefits for engine users. The common-rail concept was adopted also because it has the advantage that the functions of pumping and injection control are separated. This allows a straightforward approach to the mechanical and hydraulic aspects of the design, with a steady generation of fuel oil supply at the desired pressure ready for injection. The common-rail concept also has the unique advantage that it allows the fuel injection valves to be individually controlled. 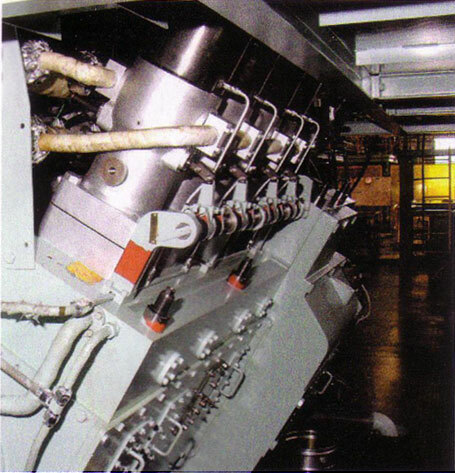 Usually there are three fuel injection valves in each cylinder cover, and in the Sulzer RT Flex engines they are operated mostly in unison but under certain circumstances they are operated separately for optimum combustion performance. The common-rail concept thus provides an ideal basis for the application of a fully-integrated electronic control. The combined flexibilities of common rail and electronic control provide improved low-speed operation, engine acceleration, balance between cylinders, load control, and longer times between overhauls. They also ensure better combustion at all operating speeds and loads, giving benefits in lower fuel consumption, lower exhaust emissions in terms of both smokeless operation at all operating speeds and less NOx, emissions, and also a cleaner engine internally with less deposits of combustion residues. Engine diagnostics are built into the system, improving engine monitoring, reliability and availability. As the common-rail system is built specifically for reliable operation on from-the well-established economy of low-speed marine diesel engines but rather opens up new possibilities for even better economy, ease of operation, reliability, times between overhauls and lower exhaust emissions. It is more than ten years since development of the Sulzer RT Flex common-rail system began and more than 20 years since the first tests were made with electronically-controlled fuel injection in Winterthur, Switzerland. The early camshaft less systems developed for Sulzer engines relied on integral electronic control but used individual, hydraulically-operated fuel injection pumps. However the change in injection concept from the individual, hydraulically-operated fuel injection pumps to a common rail system in 1993 was made because the system with individual pumps did not offer potential for further technological development despite it having integral electronic control. Electronic control was found to be insufficient by itself and a new fuel injection concept was recognised as essential. Common rail was seen as the road ahead and it is applied in Sulzer RT Flex engines. Sulzer RT Flex engines are thus notably different from other electronically-controlled low-speed diesel engines today as Sulzer RT Flex engines are unique in combining the benefits of both common-rail systems and electronic control. Figure 01 - Principle elements of the common rail system on a Sulzer RT-Flex engine. 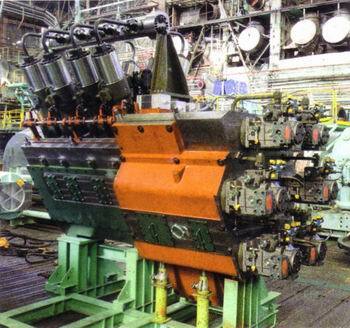 Note that there are variations on this arrangement in the various RT Flex engine types depending upon the type and number of cylinders. Sulzer RT Flex engines are essentially standard Sulzer RTA low-speed two stroke marine diesel engines except that, instead of the usual camshaft and its gear drive, fuel injection pumps, exhaust valve actuator pumps, reversing servomotors, and all their related mechanical control gear, they are equipped with a common rail system for fuel injection and exhaust valve actuation, and full electronic control of engine functions. 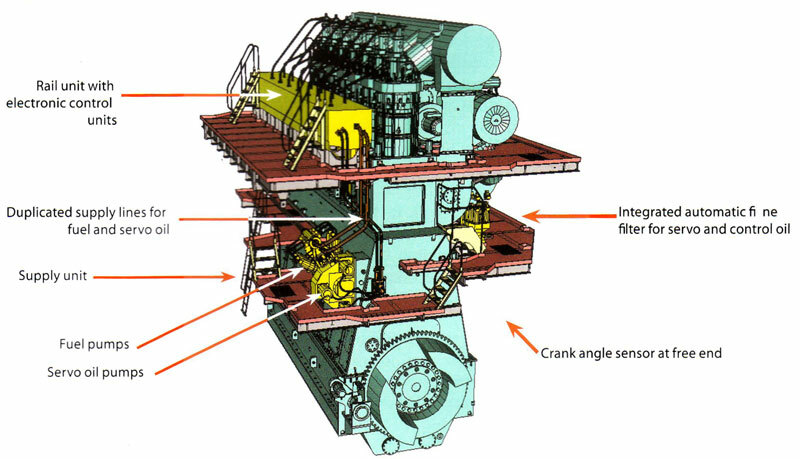 The hardware in the RT Flex system is being developed in four principal sizes for the six engine types currently in the programme (see Table 1). 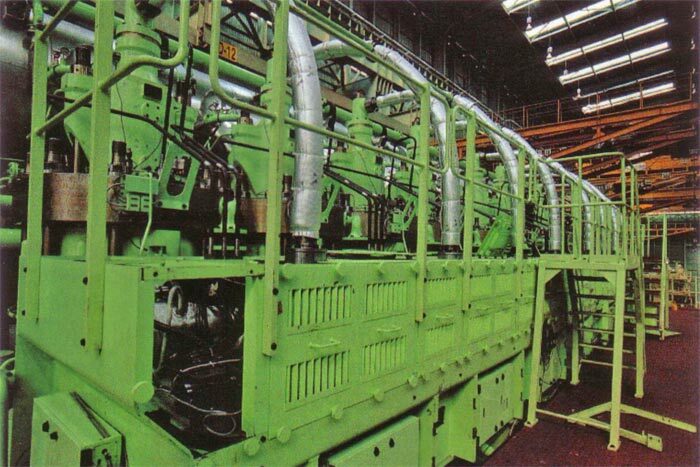 The six RT Flex engine types cover a power range of 8100 to 80,080 kW (11,000 to 108,920 bhp). This illustrates one of the advantages of the common-rail system in that hardware is standardised for groups of engine types, not just for the various cylinder numbers. Figure 02 - Schematic of the common rail systems in Sulzer RT-Flex engines. crankcase. However, for all subsequent engines, the location of the supply unit has since been standardised on the front of the engine (on the same side as the rail unit) and at about mid height. 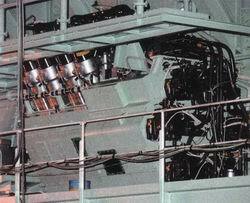 This keeps the engine 'footprint' small so that the engines can be located far aft in ships with fine after bodies. The supply unit is naturally at the location of the gear drive: at the driving end for five- to seven-cylinder engines, and at the mid gear drive for greater cylinder numbers. The supply unit has a rigid housing of GGG-grade nodular cast iron. The fuel supply pumps are arranged on one side of the drive gear and the hydraulic servo-oil pumps are on the other side. This pump arrangement allows a very short, compact supply unit with reasonable service access. The numbers, size and arrangement of pumps are adapted to the engine type and the number of engine cylinders. Figure 03 - Supply unit for a Sulzer 12RT-Flex96C engine with the fuel pumps in a vee form arrangement on the left, and servo oil pumps on the right hand face of the control gear drive. The fuel pumps all deliver into the collective seen above the fuel pumps. Click on picture for larger size. For RT Flex Sizes I and IV, the supply unit is equipped with between four and eight fuel supply pumps arranged in Vee from. The size O supply unit, however, has just two or three supply pumps in-line. Two sizes of fuel pumps are employed for all RT Flex engines, both based on the well-proven injection pumps used in Sulzer Z-type medium speed four-stroke engines though with some adaptations to suit their function as supply pumps and to raise their volumetric efficiency up to a very high degree. For Sizes 0 and I, the fuel pump elements are based on the injection pumps of Sulzer ZA40S engines, while the Size IV pumps are based on the injection pumps of the Sulzer ZA50S engine type. 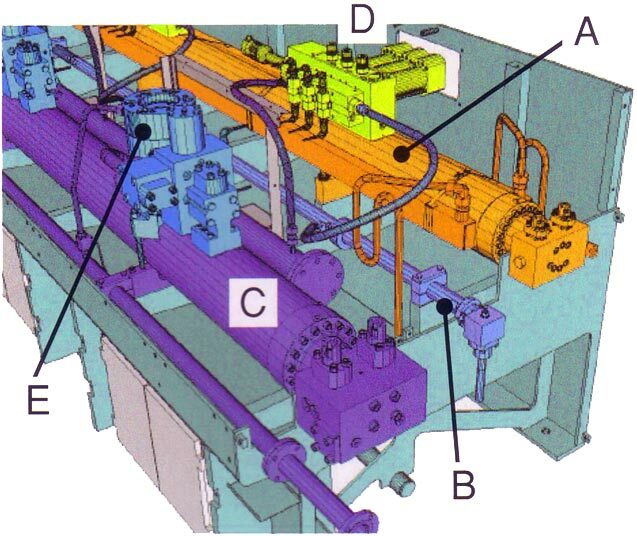 The fuel supply pumps are driven through a camshaft with three-lobe cams. This camshaft cannot be compared with the traditional engine camshaft. It is very short and much smaller diameter, and is quite differently loaded. There is no sudden, jerk action as in fuel injection pumps but rather the pump plungers have a steady reciprocating motion. With tri-lobe cams and the speed-increasing gear drive, each fuel supply pump makes several strokes during each crankshaft revolution. The result is a compact supply unit. 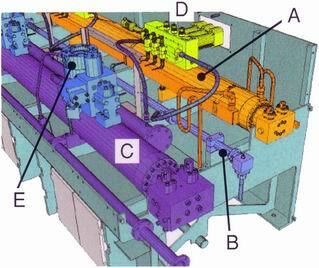 Two designs of camshaft are employed. For Size I it is manufactured in one piece. For Size IV, the camshaft is assembled from a straight shaft on to which the tri-lobe cams are hydraulically press fitted. This latter form of construction has been used for decades in Sulzer Z-type engines. It is extremely service friendly and minimises maintenance cost. The camshaft bearings have an aluminum running layer. Figure 04 - Supply unit for a Sulzer 12RT-Flex96C engine with the fuel pumps in a vee form arrangement on the left, and servo oil pumps on the right hand face of the control gear drive. Click on picture for larger size. Figure 06 - Close view of the fuel fuel supply pumps in Figure 04 showing the regulating linkages. Click on picture for larger size. Figure 05 - Cutaway drawing of the fuel pump element for the RT-Flex96C engines. Click on picture for larger size. cam and roller are less than for the original pumps in ZA40S and ZA50S engines. For every individual fuel pump element of the supply unit, the roller can be lifted off the cam, blocked and manually taken out of service in case of difficulties. The fuel pumps deliver the pressurised fuel to an adjacent collector from which two independent, double-walled delivery pipes lead upwards to the fuel rail. Each delivery pipe is dimensioned for full fuel flow. The collector is equipped with a safety relief valve set to 1250 bar. An equivalent arrangement of a collector and duplicated independent, double-walled delivery pipes is employed for the servo oil supply. Servo oil is used for exhaust valve actuation and control. It is supplied by a number of swash plate-type axial piston hydraulic pumps mounted on the supply unit. The pumps are of standard proprietary design and are driven at a suitable speed through a step-up gear. The working pressure is controllable to allow the pump power consumption to be reduced. The nominal operating pressure is up to 200 bar. The number and size of servo oil pumps on the supply unit depend on the engine output or number of engine cylinders. There are between three and six servo oil pumps. The oil used in both the servo and control oil systems is standard engine system lubricating oil, and is simply taken from the delivery to the engine lubrication system. The oil is drawn through a six-micron automatic self cleaning fine filter to minimise wear in the servo oil pumps and to prolong component life. After the fine filter, the oil flow is divided, one branch to the servo oil pumps and the other to the control oil pumps. Control oil is supplied at a constant 200 bar pressure at all engine speeds by two electrically-driven oil pumps, one active and the other on standby. Each pump has its own pressure-regulating valve and safety valve attached. 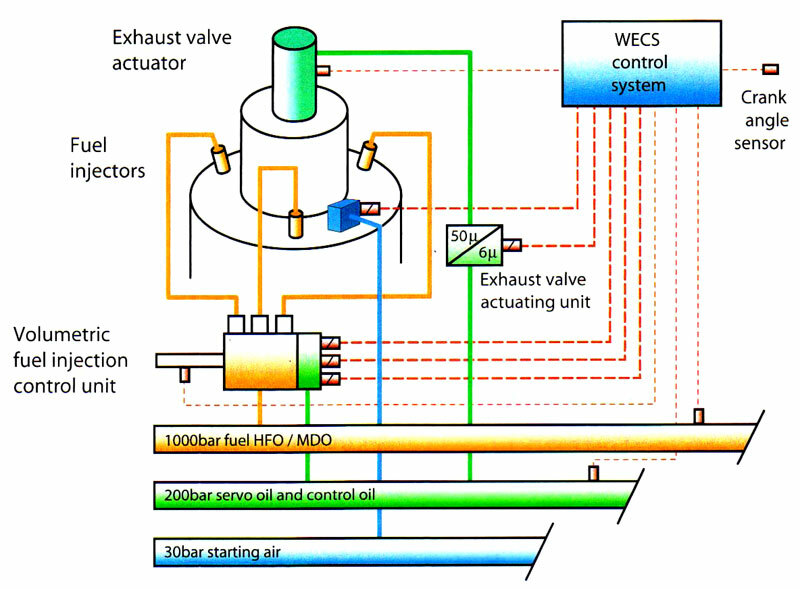 The control oil system involves only a small flow quantity of the fine filtered oil. 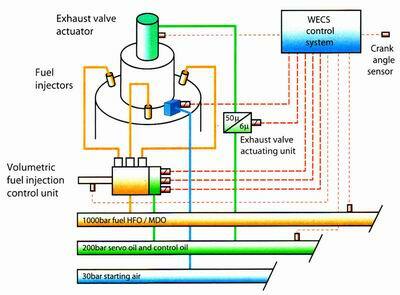 The control oil serves as the working medium for all rail valves of the injection control units (ICU). The working pressure of the control oil is maintained constant to ensure precise timing in the ICU. It is also used to prime the servo oil rail at standstill thereby enabling a rapid starting of the engine. 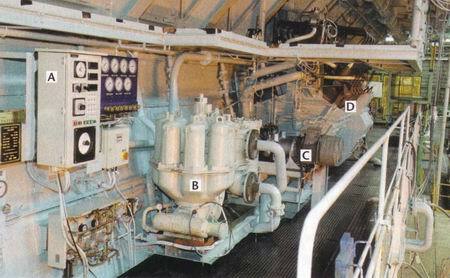 Figure 07 - Various RT Flex equipment on the half platform of a 12RT Flex96C engine. The rail unit is located at the engine's top platform level, just below cylinder cover level. It extends over the length of the engine. It is fully enclosed but has good maintenance access from above and from the front. 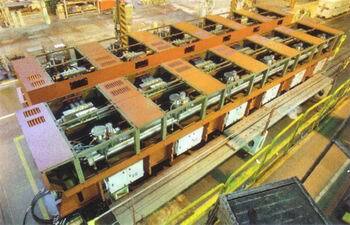 The rail unit contains the rail pipes and associated equipment for the fuel, servo oil and control oil systems. The starting air system is not included in the rail unit. Figure 08 - Cylinder tops and rail unit of a Sulzer RT Flex96C engine. The electronic control units are mounted on the front, below the rail unit. Click on picture for larger size. Other manifold pipes are provided for oil return, fuel leakage return and the system oil supply for the exhaust valve drives. 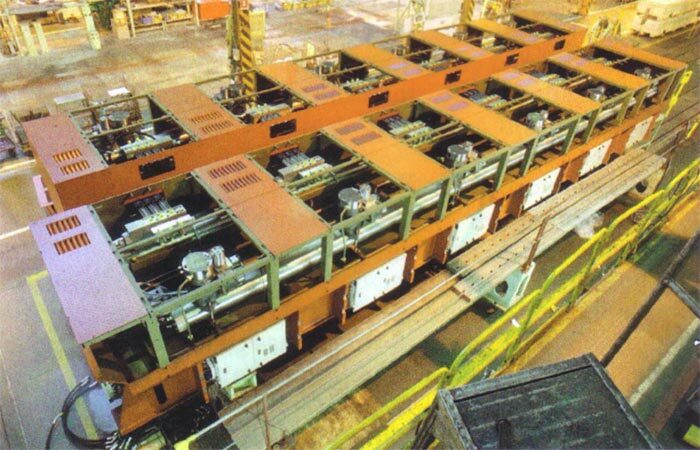 Figure 10 - Two section of rail for a 12 cylinder Sulzer RT Flex96C engine ready for assembly. Click on picture for larger size. The fuel common rail provides storage volume for the fuel oil, and has provision for damping pressure waves. There is no need for energy storage under gas pressure. The volume of the common-rail system and the supply rate from the fuel supply pumps are such that the rail pressure is very stable with negligible pressure drop after each injection. In the RT Flex Size I, the high-pressure pipe for the fuel rail is modular with sections for each cylinder and flanged to the individual injection control units for each cylinder. With the Size IV, the high-pressure fuel rail was changed to a single-piece rail pipe to shorten assembly time and to simplify manufacture. A single length of rail pipe is installed in each section of the rail unit. The only high-pressure pipe flanges on the Size IV pipe are the end covers. The common rail system is designed with very high safety margins against material fatigue. The fuel rail pipe for instance has a very special inner shape to keep the stress amplitude in cross-bored drillings remarkably low. The fact that, by definition, common rails have almost constant pressure levels further increases the safety against high cycle fatigue cracking compared to conventional injection and actuator systems with high pressure cycles. 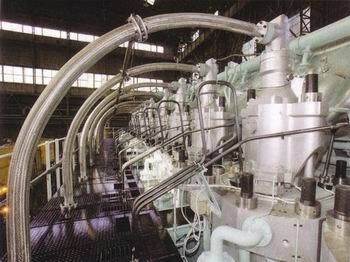 The high-pressure rail is trace heated from the ship's heating system, using either steam or thermal oil. The simplification of the fuel rail for Size IV, without intermediate flanges, compared with that for Size I allowed the trace heating piping also to be simplified. The trace heating piping and the insulation are both slimmer, allowing easier service access inside the rail unit. 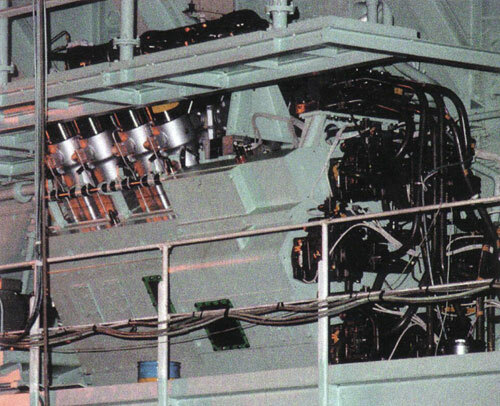 Figure 11 - Cylinder tops of a 12 cylinder Sulzer RT Flex96C engine with the rail unit under the platform on the left. The hydraulics pipes for the exhaust valve drives arch up from the exhaust valve actuators on the servo oil rail. The sets of triple high pressure fuel pipes rise up form the control units on the fuel rail. Click on picture for larger size. 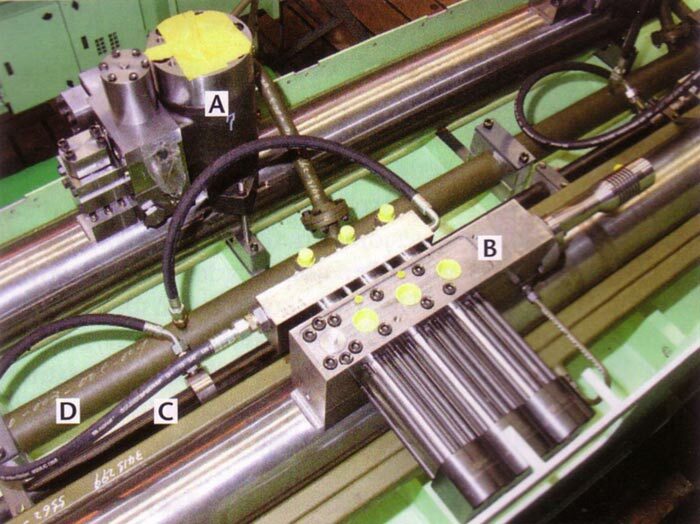 Figure 12 - Inside a Size 4 rail unit during assembly. The exhaust valve actuator (A) is mounted on the servo oil rail and the injection control unit (B) is on the fuel rail. Next to the fuel rail is the smaller control oil rail (C) and the return pipe for servo and control oil (D). Click on picture for larger size.